Rapid Lawn Landscape Solutions Ltd. is your best Regina landscaping company. We have helped many customers achieve the yards they have always dreamed of. In our latest article, we share some enlightening landscaping inspiration. 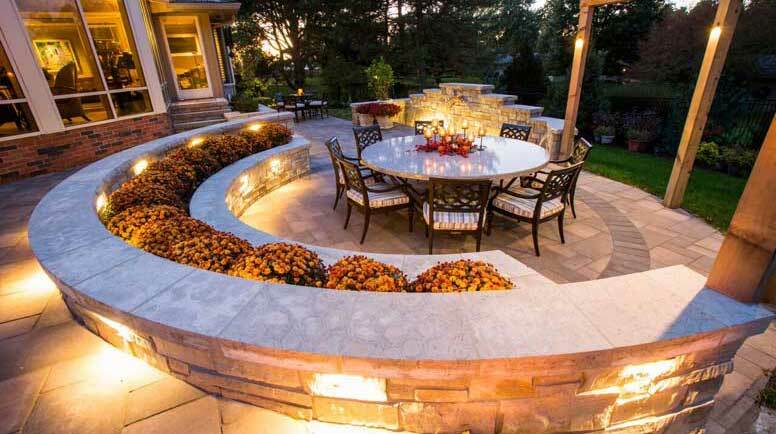 Homeowners are spending a lot more time in their outdoor living spaces these days and thanks to modernized exterior lighting that is now both functional and attractive, outdoor enjoyment no longer has to end when the sun sets. In addition to providing brightness, carefully placed lighting can help create a mood or ambiance in your yard, draw attention away from problem spots and highlight special features. While it’s fairly easy to understand the merits of outdoor lighting, it’s a bit more overwhelming to figure out what kind of lighting to select as there are seemingly endless choices. Let’s look at the brightest trends for this year. Bye, bye, bland. White lights used to be the best (and only!) options on the market but now retailers offer a palette of colour to compliment plantings, accent lawn décor, and stylize entertaining areas. The filters can be used with white lights to bring out extra warmth or create a cool tone. Colored filters can be used to create dramatic settings and focus attention on landscape highlights. Twinkle, twinkle little light. Small lights, amassed together, hidden in plantings and walkways are very attractive and very popular right now. They can add depth to an area or provide an understated accent to landscape features. Statement lights. In contrast to small lights, big, bold, feature lights are also en vogue. There are some incredible looks that can be created with white or colored orbs (also known as illuminated globes and glow balls.) For their relatively inexpensive cost, they provide quite amazingly sophisticated looks and can be quite the conversation starters. If you are seeking a more personal bold look, consider novelty lighting. You can find outdoor lights, in a variety of finishes connected to hobbies and to support theme décor – nautical, gardening, animals, etc. Timeless style with lanterns. Lanterns aren’t new for the year. They are tried-and-true but the design materials continue to evolve so now there are finishes so match most any look you wish to create. Environmentally friendly lighting. It’s no great surprise that many homeowners are looking for lighting that supports eco-friendly living styles. LED lighting (light emitting diodes) certainly fit the bill. In addition to being energy efficient, they have incredibly long lives, expected to function for about 100,000 hours. There are a variety of attractive options. In addition, solar powered lights are becoming increasingly popular with homeowners who wish to take advantage of natural resources. Not only are these environmentally friendly but as they use renewable energy, they are friendly on the pocketbook as well. A word of catuion for those considering adding lighting outdoors: It is always good practice to consult an experienced electrician, particularly when working with outdoor features as there are different considerations to be factored than indoor installations. For more significant, showcase projects, there is indeed an art to achieveing the right effects in outdoor lighting. To bring out the moods, shadows, and magic of your yard reach out to Rapid!